After having found a great red ink with Diamine Dragon Red, I wanted to find a bright orange ink. 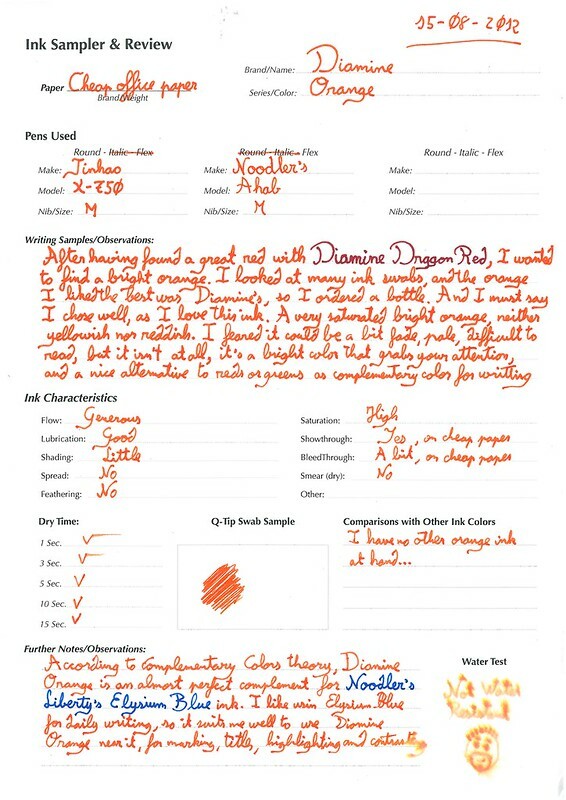 I looked many ink swabs, and the orange I liked the best was Diamine Orange, so I ordered a bottle. And I must say I chose well, as I love this ink! A very saturated, bright orange, neither yellowish nor reddish. I feared it could be a bit fade, pale, difficult to read, but it isn't at all, it's a bright color that grabs your attention, and a nice alternative to reds or greens as complementary color for writing. According to color theory, Diamine Orange is the almost perfect complementary color for Noodler’s Liberty’s Elysium (LE) blue ink. I like using LE blue for daily writing, so it suits me well to use Diamine Orange near it, for titles, marking, highlighting and contrasting. The ink is not waterproof, as expected, but it resist way better than I would have thought. The bottom right corner had been submerged in water for one minute, and you can still (almost) read the text. All content copyright LostIBrittany's Pens © 2013 • All rights reserved.